This post is sponsored by Heinz®. Get this delicious Holiday Appetizer and get inspired to create your own Recipe for Happiness. 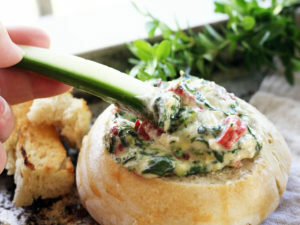 One of my all-time favorite party recipes is spinach artichoke dip. I love it hot, served with all types of dippers. 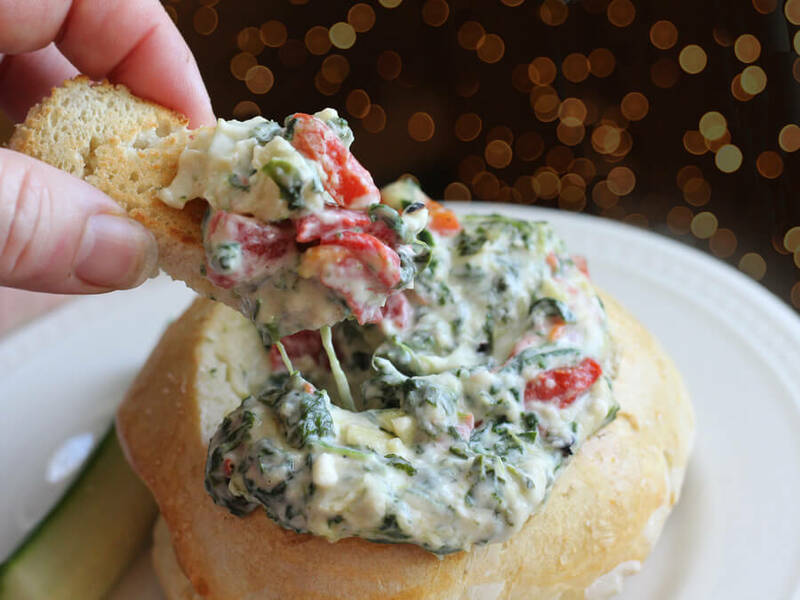 This recipe for Three Cheese Spinach Artichoke Dip is a dreamy holiday appetizer that everyone will go crazy for. 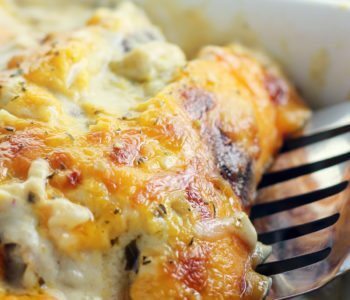 We used a blend of Monterrey Jack, Parmesan, and Feta cheeses for over-the-top cheesy flavor. Plus, get our recipe for happiness: serve this dip hot in Homemade Bread Bowls. 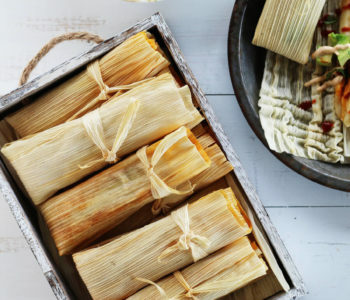 So which part of this delicious holiday recipe are you most excited about? 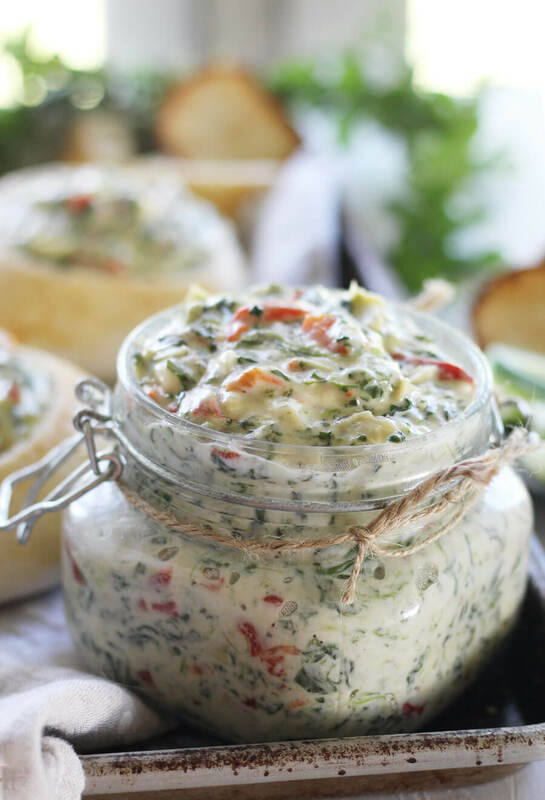 Is it the ooey-gooey dip loaded with spinach, artichokes, peppers and all the cheese? Or is it the warm, homemade bowl that you can eat? There is no wrong answer to this question. I know, I know, the Three Cheese Spinach Artichoke is calling your name. 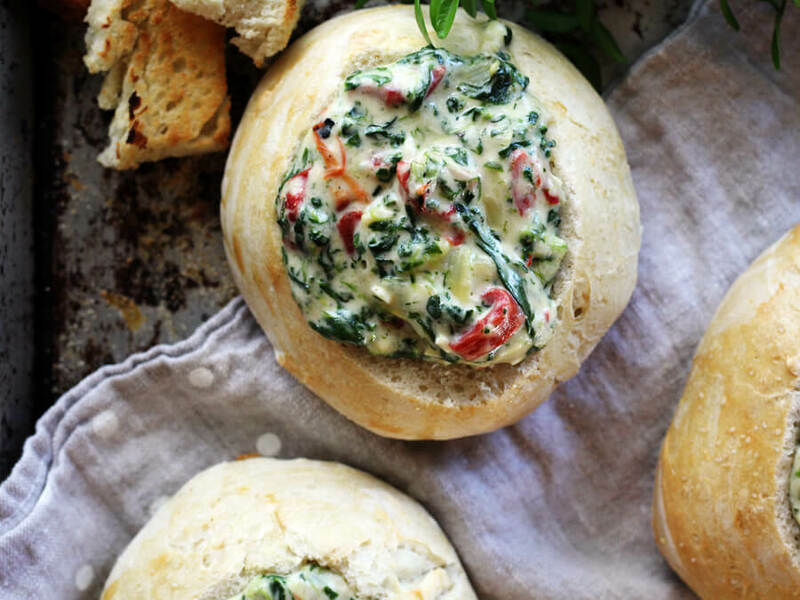 But first things first, we’ve got to make these heavenly edible bread bowls. For this recipe, we made 8 individual small sized bowls. If you would like, you can make larger bowls for group serving. This recipe was created with a small holiday gathering in mind, so each little bread bowl is like a foodie gift. ? Get step-by-step instructions on how to make these bread bowls in the recipe below. It really is easier than you think! 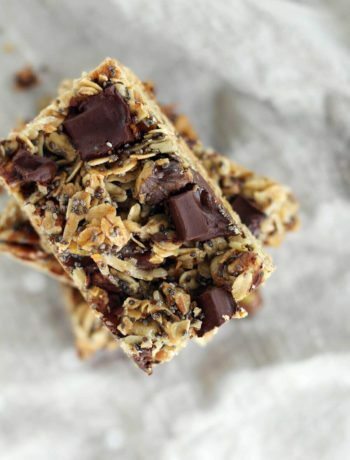 All it takes is a few basic pantry ingredients, time and love. TIP: Make this easier by mixing it up and kneading it in the bowl of your stand mixer. Once the dough has been prepared, the next step is to bake until golden. 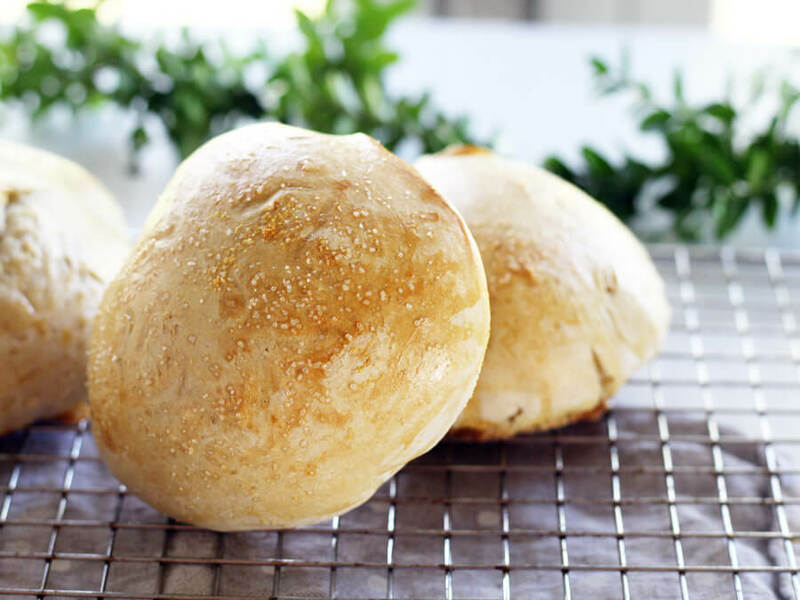 To get a nice crust, brush the outside of the bread bowls with egg wash. Wouldn’t these be great with a ladle full of hot, potato soup, too? After the bread bowls are golden, let them cool completely. Then, slice off the top and scoop out the insides. You want to leave about half an inch or more of the bread crust on the bottom and all sides. TIP: Don’t toss the tops and the insides. Slice, brush lightly with oil, and broil for a minute or two. 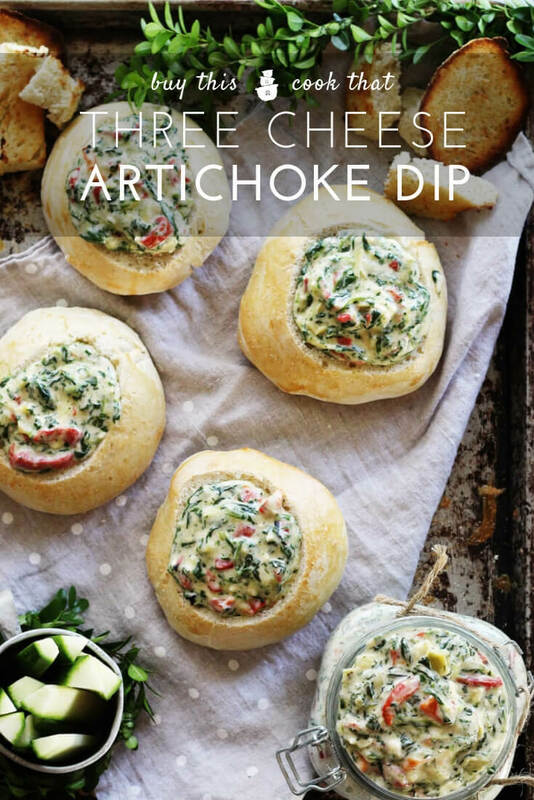 They make great dippers for the Spinach Artichoke Dip. Any time you are cooking or baking during the holidays, you want your recipes to be extra special. 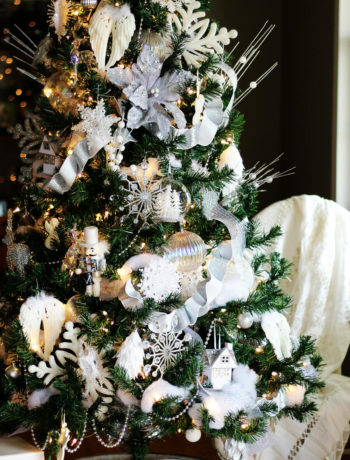 The little touches show your family and loved ones that you care. 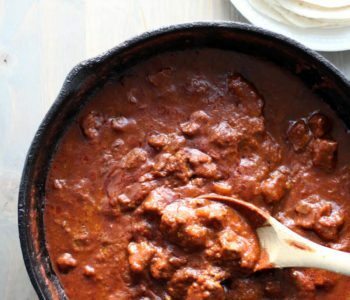 Our fave extra touch in this recipe? 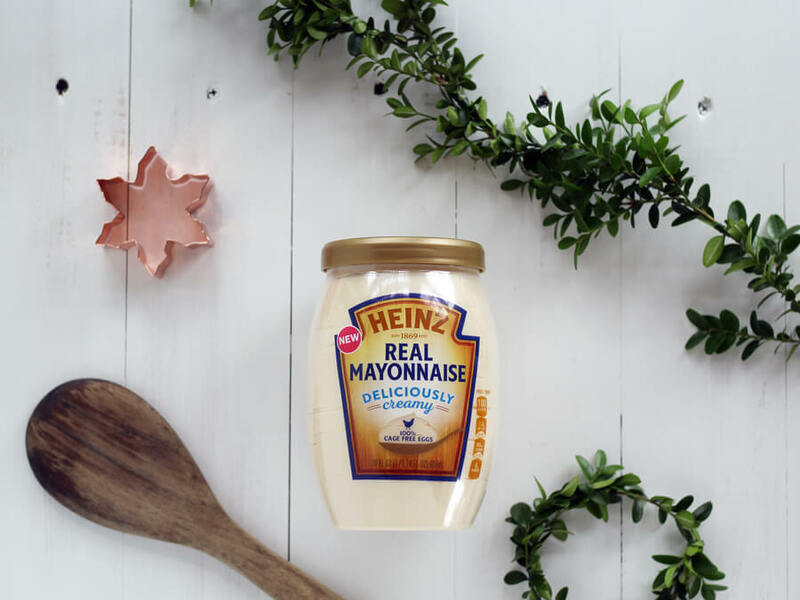 Heinz® Real Mayonnaise. The wholesome zip and creaminess of mayonnaise brings this recipe together. You know how a cheesy dip will “set up” as it cools. Adding mayonnaise helps keep it smooth. And hello, it makes this spinach artichoke dip taste amazing! 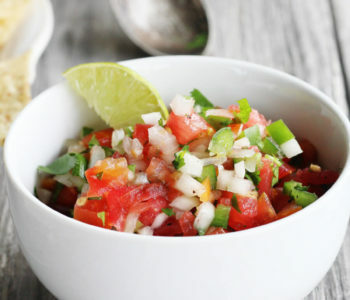 To create tasty food memories like this, visit YourRecipeForHappiness.com. 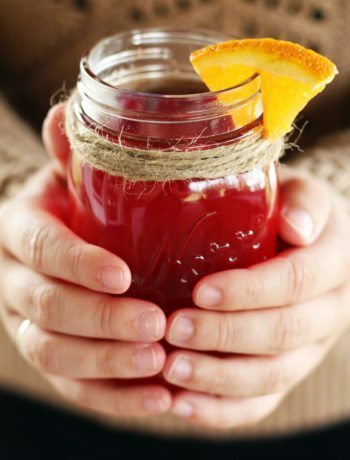 The Your Recipe For Happiness website helps you create memories with your friends and family during the Holiday Season. 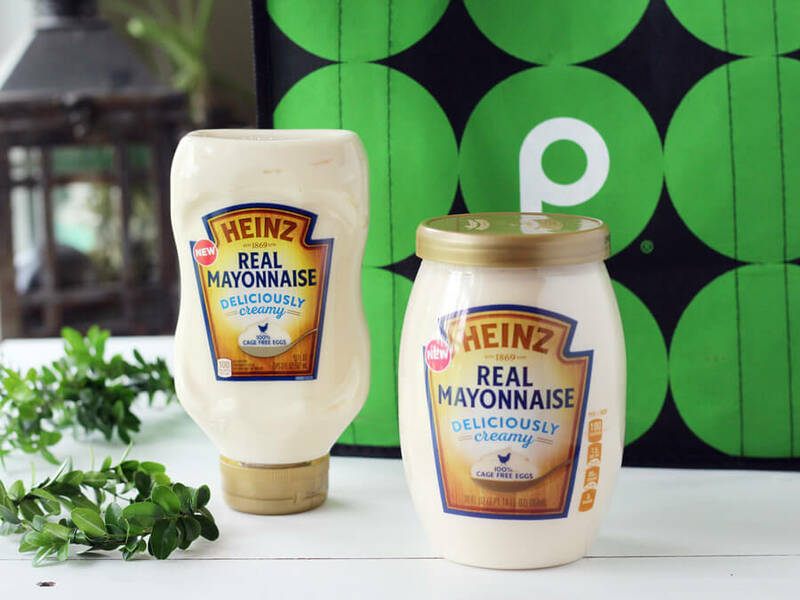 There are tips and recipe ideas, using Publix, Kraft, Pepsico and General Mills products, to turn any baking, cooking, or crafting occasion into an unforgettable moment. TIP: Cook over very low heat and whisk constantly for about 5 minutes. You want the flour to cook slowly and the flavor to develop. Once the butter and flour mixture has cooked, quickly whisk in the seasonings. 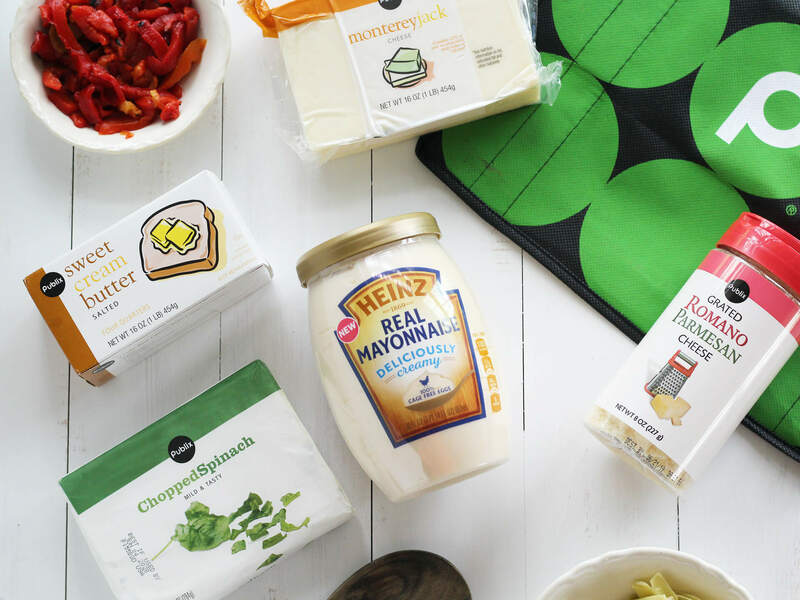 We stuck with the basics since we have so much flavor going on with the three cheeses. But we did sneak in a pinch of cayenne pepper. Increase the heat to medium, and gradually stir in milk. I used whole milk for this recipe, but you can use 2% if you prefer. Cook and stir until the white sauce starts to bubble and thicken. Lower the heat back down to a simmer, and fold in the Heinz® Real Mayonnaise along with the remaining ingredients. All of ‘em. To add the colors of the season, we used canned artichoke hearts, green spinach, and sweet roasted red peppers. Don’t you love it? The peppers give a sweet pop of flavor to the spinach artichoke dip that is unexpected. For convenience, we used a thawed, drained and SQUEEZED pack of frozen spinach for this recipe. You can use fresh if you have it. TIP: Not a fan of bell peppers? Chop up a tomato or two instead to get the seasonal red color. Add a few sliced olives for fun. Once everything is folded together, time to taste. 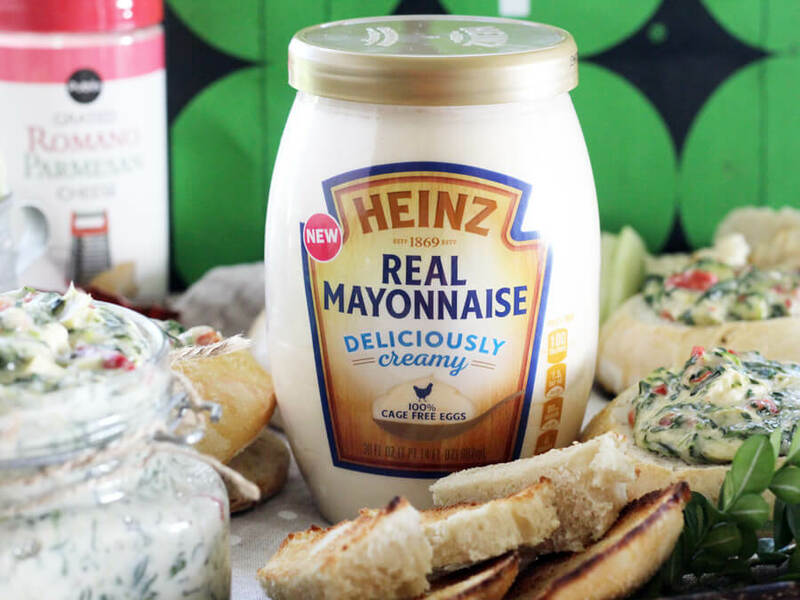 This is where you can add a little more cayenne, a splash of milk if needed, or add more Heinz® Real Mayonnaise. (Guilty as charged!) Maybe I’ll still be on the Nice List. 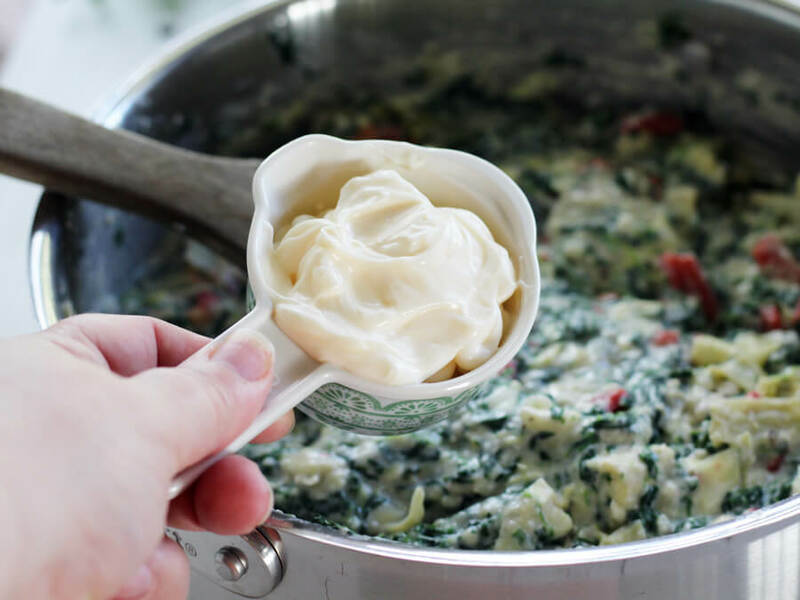 Creamy + cheesy Spinach Artichoke Dip made with three types of cheese, roasted red peppers, and more. Perfect when served in our golden, homemade bread bowls. Perfect for dipping, this holiday appetizer recipe is a crowd pleaser. 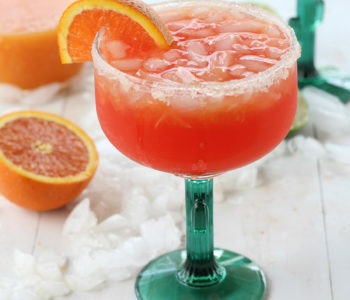 In the bowl of a stand mixer or large bowl, stir together the yeast and warm water, reserving 1 tablespoon of the water. Let the mixture rest and "bloom" for 10 minutes. Using the mixer paddle, stir the olive oil and salt into the yeast mixture. Gradually add HALF of the flour 1/4 cup at a time until the dry flour is incorporated. Change the mixer paddle to a dough hook, and add the remaining flour 1/4 cup at a time. Knead the dough for 5 minutes with the stand mixer until it is stretchy and smooth. Grease a bowl with oil and place the dough ball in the bottom. 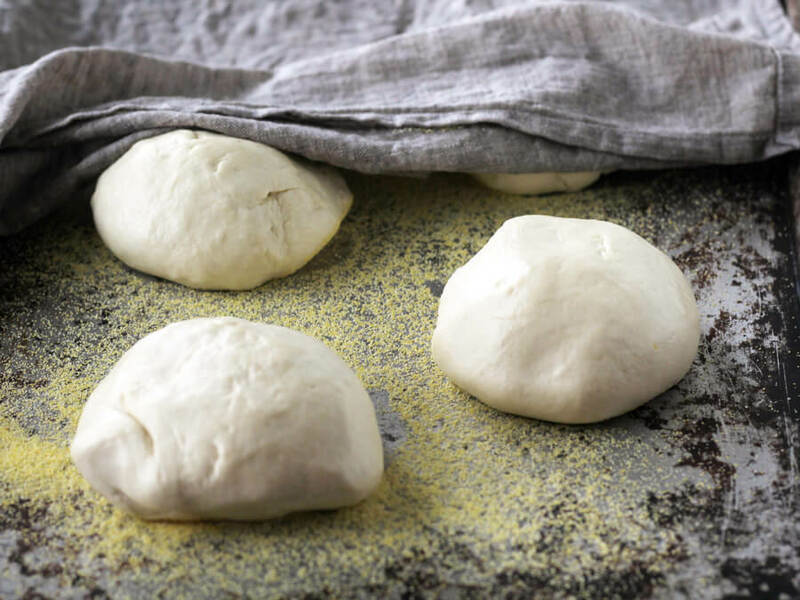 Flip the dough ball to coat both sides. Cover with a warm, damp towel and let rest for 45 minutes until doubled in size. Divide the doubled dough into 8 even sized pieces. Form each piece into a flattened "ball". Sprinkle the bottom of a rimmed baking sheet with cornmeal. Arrange the dough balls on the baking sheet. Cover with a warm, damp towel and let rise for 45 minutes. Preheat oven to 400 degrees. Place oven rack in center of oven. Whisk together the egg white and remaining water. Brush the dough balls with the egg wash and sprinkle with sea salt. Bake for 15 minutes. Remove from oven, brush with more of the egg wash, and bake for 15 more minutes. Transfer to a wire rack and let cool completely. Using a bread knife, carefully slice off 1/2 inch from the top of each piece of bread. With a small knife, cut out the center of each bread bowl. Reserve the bread pieces to toast for dipping. In a medium saucepan, heat butter over low heat. Whisk in the flour. Cook and stir until bubbly, about 5 minutes. Whisk in the salt, black pepper and cayenne. 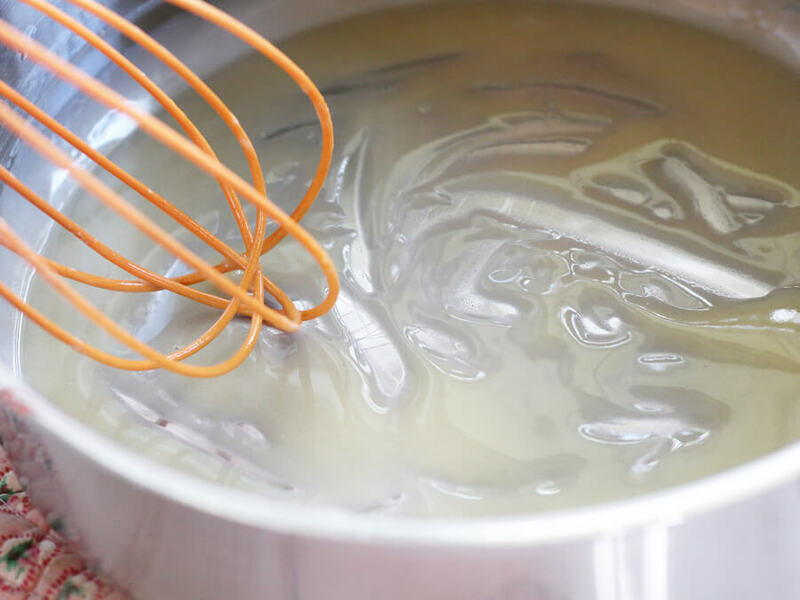 Gradually whisk in the milk until smooth. Increase heat to medium high and bring to a low boil, stirring constantly until thickened. Lower heat to a simmer. 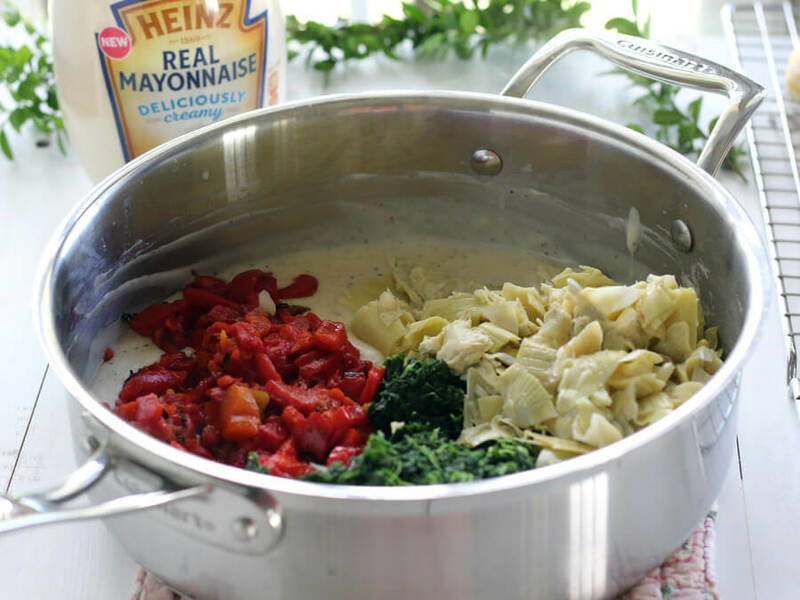 Fold in the Heinz® Real Mayonnaise and all other ingredients (spinach, artichokes, peppers and cheeses.) Cook and stir until the cheese has melted. Add more mayonnaise and milk as needed for desired consistency. Serve hot or warm in the prepared bread bowls. Dip with the toasted bread tops, insides, veggies and more. Nutritional information is approximate based on the specific type of cheese you use and does not include additions. 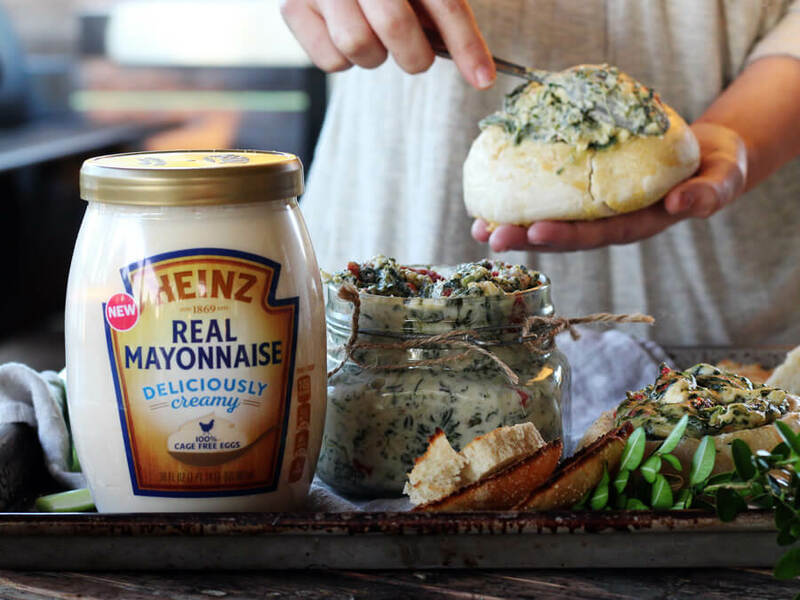 Now that the spinach artichoke is smooth and creamy, hot and bubbly, and the cheese is perfection, spoon the dip into the prepared homemade bread bowls. 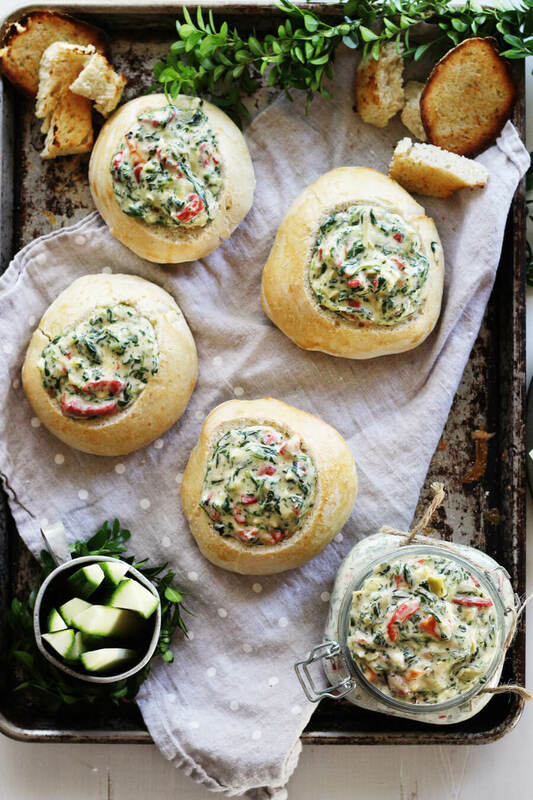 Fill each bread bowl to the TOP with Three Cheese Spinach Artichoke Dip. Speaking of getting the family in the kitchen, this is a fantastic recipe to make together. 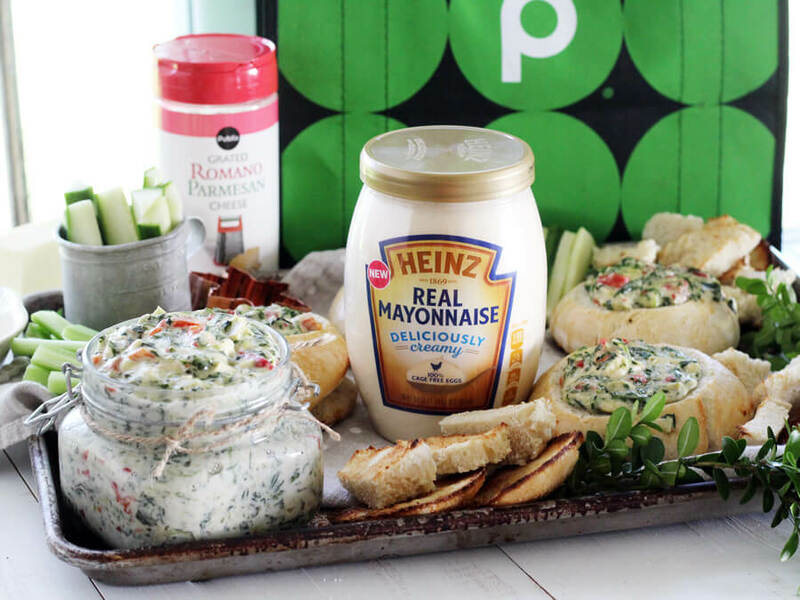 The kids will have so much fun scooping out the bread, mixing up all the cheese and mayo into the dip, and then piling the dip on. Maybe a little messy, but that’s why they make soap and water, right? And the memories you create this holiday in the kitchen will last a lifetime! 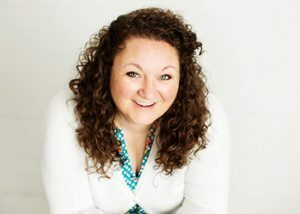 To create everyday memories, visit YourRecipeForHappiness.com and enter for a chance to win one of five (5) $100 Publix gift cards. 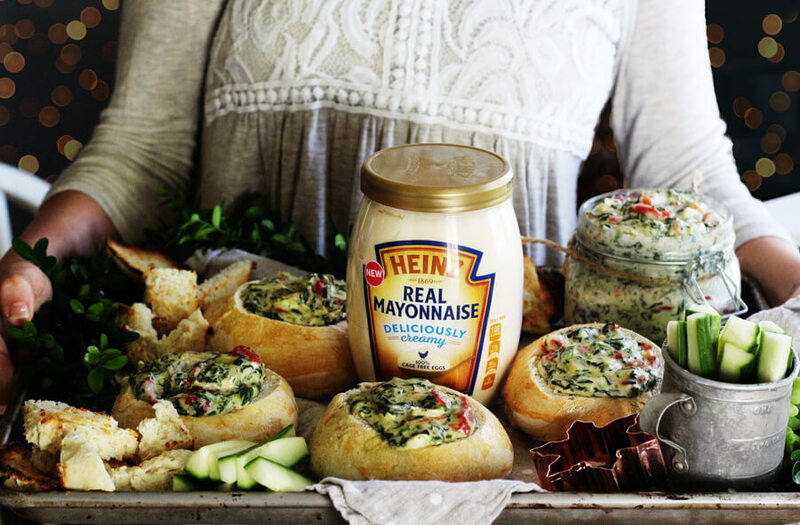 We can’t wait for you to try this yummy holiday appetizer recipe. What are your favorite food memories during the holidays? We would love to hear from you! Leave us a message in the comments below.